This is a tale of one plant in two seasons. The wax begonia pictured above is proof that we can’t always look at a thing and tell if it’s viable: whether it will live or die, grow or shrink, strengthen or weaken. Some things require purposeful work and the patient passage of time before you know how it will turn out. A year ago, my begonia was looking pretty much like you see it now. It thrived spring to fall, putting out some killer blooms. It was so lovely that I decided it should winter over in my South-facing family room. It did great for a while, purposefully placed on a stand before a wall of triple-hung, nearly floor-to-ceiling windows. Ah, but what a difference a few weeks can make. Little by little, that plant began to whither despite the sunlight, the water and tender care. I cut back the dead blooms that were dropping all over the floor. I trimmed the dying stalks. It kept dying. I finally had enough. In a fit of frustration, I took that begonia out to the deck, determined to dump it over the side. What had I been thinking? Better to stop wasting time with this miserable specimen. Time to let it go, buy another one come Spring. I was about the hurl it into oblivion when I hesitated. I had so loved the little plant when it was beautiful; and hadn’t my neighbor successfully kept her geraniums alive through a winter? Maybe I’d give the begonia another chance. I proceeded to hack that plant back to a few simple stalks that looked like bent fingers, not a leaf remained and there were no blooms whatsoever. I removed the naked plant from its pot, gently, but firmly displacing most of the soil, which I discarded. I repotted in fresh, fertile soil. The plant looked pitiful, but I was hopeful. I watered it well, let it drain and placed it back in its old spot before the window. In the weeks that followed the begonia grew a few scrawny sprigs, but nothing to brag about. Those slender stems grew fatter in time and stretched out. Leaves sprouted and fanned out. When spring temperatures finally arrived, I put the plant on the deck, where it promptly wilted and nearly died again. The intense direct sunlight was not what it needed. Our lives can be a lot like that begonia’s life cycle. We start out in full bloom. In time, we can begin to deflower, drop leaves, dry up and become a thing worthy of the trash heap. And yet God, who Scripture compares to a gardener, keeps working with us, ever committed to cultivating our growth through all life’s seasons. Like any good gardener, God works at bringing out the best in us. He expects results, but He isn’t in a hurry. He prunes back the life-sucking dead weight. He moves us from a spot that we may consider ideal – a job we love, a relationship we started — because He knows the light isn’t right in that place. He gives us a firm shake now and then, like the North wind blowing leaves off the oak trees in my backyard, forcing us to cast off the dirt we cling to and that clings to us. 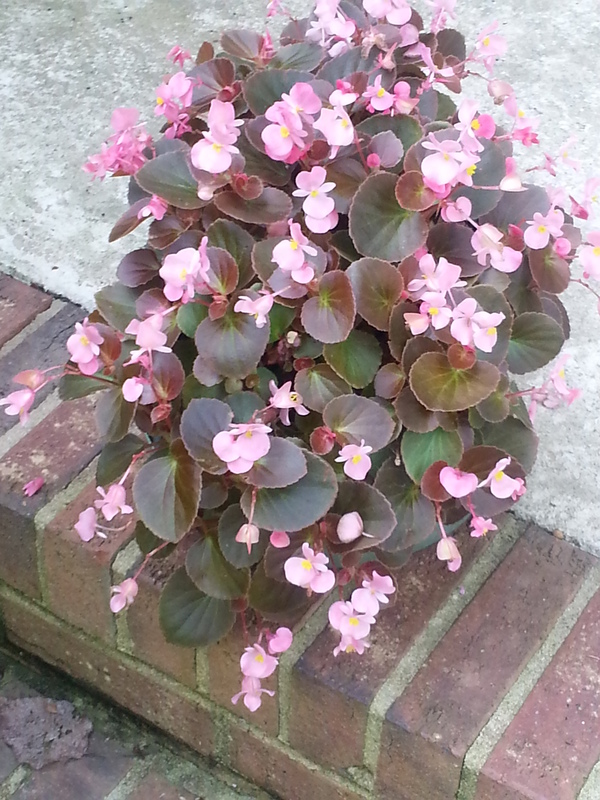 All that God is really asking of us is that we do what my little begonia did: Submit to the work of His hands. Through the painful pruning, shaking and changing, to just abide and do what a healthy plant does naturally: bloom, bear fruit.